MyFourWalls 1.0.7 – Furnishing planner. MyFourWalls is an easy-to-use home planning tool that lets you play with new design choices in an existing space or plan the entire interior of a new home. 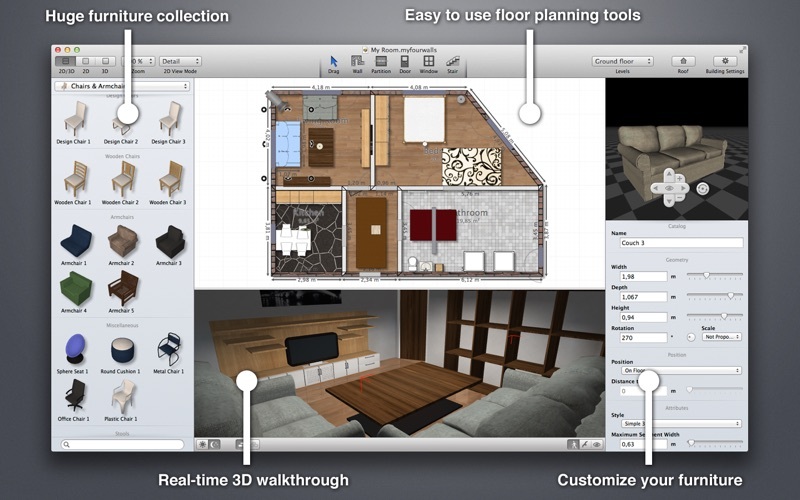 Take a 3d virtual house tour in real time to get an authentic impression of your new space. Before rolling up your sleeves, let MyFourWalls help you plan the cozy home you’ve always wanted. Create walls, doors, windows and stairs with the click of a mouse and start furnishing your rooms. Choose from a broad range of customizable furniture and try out where to best place your favorite items. Take a 3D house tour in daylight or at night and get an idea of the perfect furniture arrangement to add that “Wow!” factor to your home. MyFourWalls offers a huge furniture and materials collection. All items can be customized to your taste – simply select your favorite item, adjust its height, width, number of drawers or shelves and choose from different materials and design options. Switch between day and night mode and select individual lamps to switch on or off to compare different lighting options. If a room seems to be too dark, simply add a lamp or two. Play with the settings until you’re happy with what you see. MyFourWalls’ 3D view registers all changes in real time so you can see how the ambiance of your space changes as soon as you rearrange light fixtures or furniture. Next story iExplorer 4.1.11 – View and transfer files on your iOS device. Previous story Moneyspire 2018 18.0.5 – Comprehensive, user-friendly personal-finance software. Home Inventory 3.7.4 – Easily inventory your possessions. Home Inventory 3.3.2 – Easily inventory your possessions.